MAME (Multiple Arcade Machine Emulator) is an Arcade game emulator for playing Arcade games on your PC, Mac, Linux and just about any other operating system, this guide will concentrate on the PC version of MAME. There are many builds (versions) of MAME from the Command Line version to the Win32 version, this guide will look at the Command Line version because its the first one to be released when a new version comes out and it offers the fastest possible framerate (speed) available. Setting MAME up is not for the faint hearted as there are going to be lots of steps and ini files to edit but I will try to make it clear enough to follow. or if you have a 64bit Operating System then download the 64bit version. 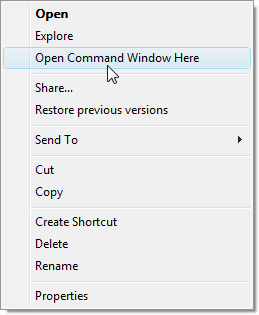 In Windows 7 onwards you can get the 'Open Command Window Here' on the right click menu if you hold down the Shift key when you right click the folder. Here's a look at the folder and files that are set up. artwork - Where background artwork is stored (not used in Gradius games). ctrlr - Some joystick configs, ignore if you don't have a Hot Rod or X Arcade stick. docs - MAME Documentation and disclaimers. roms - Where the Rom Images (Games) are stored. samples - Some games do not emulate some sounds and the samples would go in here (not used in Gradius games). These two are automatically created after you run MAME at least once. You may want to make this directory as well. snap - When you press F12 a screen shot is captured, this is where they are stored. To play games on MAME you will need the game rom image, put the zip file for the game in the roms directory. There is no need to extract the game zip files as MAME can read zip files. Right click to MAME directory and select Open Command Window Here. There are lots of setting in this file but I will only go into a few settings I use, read the Windows.txt file in the docs directory for more detailed information about the various setting. In the MAME directory there will now be a file called mame.ini, open the file in Notepad and look at the settings. To change a setting you change the 0 to a 1 to enabling that feature. Right lets get onto the setting I use. All the rest I leave at default. There are other command line options but its beyond the scope of this guide. This will check if the rom sets you have are working ok with you version of MAME, this is useful if you are having trouble getting a game working with the latest version of MAME. This will run the Gradius, below are the list of games you could run if you had all the Gradius related games in the roms directory. Some games have the monitor set vertically (TATE mode) in the arcades, if you have a fancy rotating Flat Panel monitor you could use the autorol feature in MAME, this will only effect games that have a vertical monitor so putting that switch on Gradius would have no effect. Toggles the On Screen Display. Use the up and down arrow keys to select the parameter (global volume, mixing level, gamma correction etc. ), left and right to arrow keys to modify it. Ctrl & Shift are modifiers to change movement speed. F4 or Esc returns to the emulation. Note: Not all games have decoded graphics and/or tilemaps. Framerate is king, if the framerate is too low the game will become unplayable, to speed up framerate you can shutdown all other programs before you run MAME, use Frame Skipping or upgrade your hardware (CPU). The thing you have got to remember is most arcade boards have more that one processor, ie.. Gradius II GOFER no Yabou has two Motorola X68000 processors and you have to emulate that on a single PC CPU, this is quite good now as the X68000 is quite an old chip but when you get the later games like Gradius IV Fukkatsu which runs a PowerPC CPU and a Voodoo graphics processor then you will need a fast PC to make the game playable. Extract the cheat.zip file to the MAME directory and you will see a file called cheat.dat. To navigate the menus in MAME use the cursor keys and Return to select the options you want. When you run the game press tab to go into the menu system and select Cheat, watch the animation below for an example. While playing the game you can then enable and disable the cheats on the fly with F6. That's about it for this guide, there are lots of other bits in MAME but this guide should get you started.